Through our Bike Walk Every Town suburban advocacy training, we’ve been meeting people doing great work in suburban Chicago communities. One of these people is Eberhard Veit, a 10-year bicycle-advocacy veteran from Crystal Lake. He has an impressive resume and has helped ensure the inclusion of biking and walking facilities and the closure of trail gaps on numerous projects throughout McHenry County. We spoke to Eberhard to learn more about his passion for bicycle advocacy and what drives him to keep going, despite the car-centric lifestyle and landscape of the suburbs. For Eberhard, his dedication to bicycle advocacy started with a failure. Ten years ago, a stretch of Rakow Road in McHenry County was set to be widened. The two-lane, wide shoulder road was to be converted into a four-lane highway without shoulders. Unfortunately, this redevelopment plan didn’t bode well for Veit who relied on this and other wide shouldered roads for his daily bicycle commute to work. However, Eberhard learned a painful lesson – he entered the project too late in the game. In the transportation decision-making process, it’s best to become involved as early as possible. A road project typically undergoes a complex planning process that includes phase I (engineering and environmental studies), phase II (development of a construction plan) and phase III (construction). A great deal of money is invested at each phase. If a bicycle or pedestrian sidepath or on-road bike lane recommendation is considered too late during phase I of the planning process, the project’s momentum may make those design additions highly unlikely. While the reconstruction of Rakow Road proceeded forward as originally planned, a spark was ignited, and Eberhard became more determined than ever to not let an opportunity pass him by. Veit was born in Germany and fondly remembers, even at the age of three, biking wherever he needed to go. 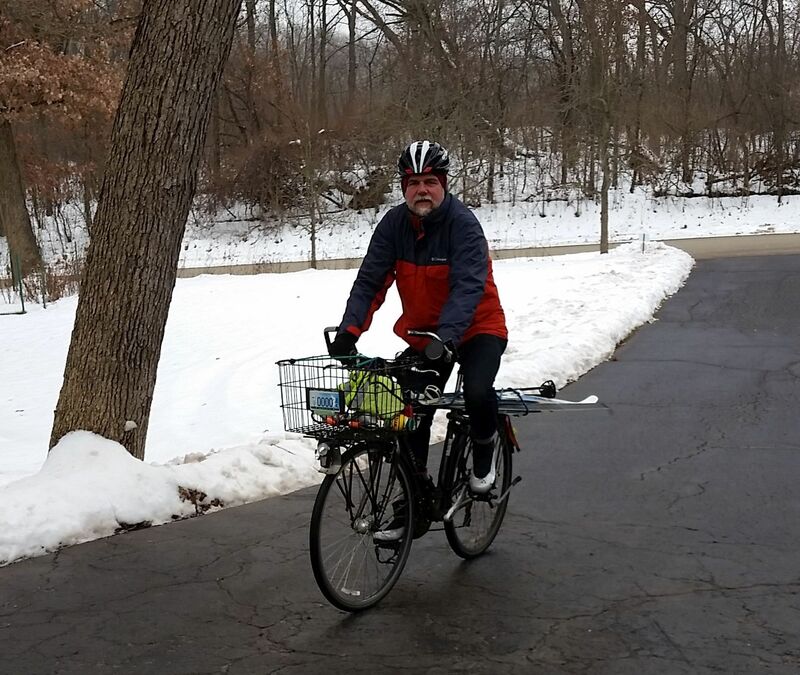 He moved to McHenry County in the 90’s for his job and continued commuting by bike to work. In 2008, he co-founded the McHenry County Bicycle Advocates (MCBA) with the intention to get more people using the bicycle for transportation. The MCBA additionally launched a Complete Streets petition requesting that all McHenry County municipalities build roads with biking, walking and transit in mind – they have so far collected over 2,200 signatures. The group also organizes a Ride of Silence, produces educational videos and offers safe cycling courses through Savvy Cycling. Over the last decade, one of the group’s greatest accomplishments was filling in a trail gap along Route 14. In 2014, the Illinois Department of Transportation (IDOT) was planning a road expansion along the highway that included a multi-use path. This was great news, of course, but the plan included a huge missed opportunity. Eberhard noticed IDOT’s proposed multi-use path dead-ended at the project border in Crystal Lake and did not connect to an existing path in Woodstock, only 1,200 feet away. Armed with facts, talking points and community support, the MCBA gathered IDOT, the McHenry County Division of Transportation, the City of Woodstock and the McHenry County Conservation Division to discuss the issue. The meeting worked. All parties involved agreed to find a way to fill the gap. Additionally, there was one final gap left in the Crystal Lake to Woodstock trail, involving a railroad crossing, which the MCBA began working to close in 2010. Together with the Conservation District, the MCBA convinced the local railroad to allow a trail crossing at Oak Street. The last missing gap of 2,800 feet will be filled in June 2018. With the success of Route 14 and the Oak Street Gap under their belt, Eberhard and the MCBA continue to advocate for solutions that improve non-motorized transportation. A recent win was the approval for phase I engineering of the Bull Valley Trail Gap near the City of McHenry. If you have any interest in improving walking, biking or transit in your community and you’re not sure where to start, we invite you to get involved with Bike Walk Every Town (for suburban residents) or the Chicago Leadership Network (for Chicago residents). We’re offering advocacy tools, webinars, networking opportunities and other resources to residents interested in advocating for better transportation options in their communities.